Each artist has an interview that will be published Thursdays throughout June and July on the online photography magazines Light Leaked, Don’t Smile, and Strange Fire Collective. Melissa Grace Kreider: When did you discover your interest in curating? Ashley Kauschinger: I have always been interested in the work of other artists. My interest in having conversations about work and to find connection and community with other artists is what initially interested me about curating. This prompted me to start my online photography magazine, Light Leaked, about 6 years ago while I was in graduate school. Because of LL I have been a portfolio reviewer and seen a ton of work. It has naturally progressed into curating or jurying online and physical exhibitions. Bridging Division is my first major curated physical exhibition at an established space. MGK: How would you describe your curatorial interests? AK: My interests in curating are rooted in creating a platform for work that I find powerful. I like to use curation to connect artists with one another and create a conversation between the works. There are so many genres and concepts that artists use photography for, and I like finding work that clearly or abstractly fits together to create a layered view of the work or to get to see it in a new way. MGK: Along with curating Bridging Division: Empathy and Humanity, you also curate the online publication Light Leaked and make your own work. Can you elaborate on the importance of doing these other projects to you and maybe talk a little bit about your series In Her Own Right? AK: They all feed and inspire one another because they are all about connection and empowerment. In Her Own Right is a series of portraits, text, and audio of women artists. The series grew out of my desire to create dialogue and inspiration with women artists, and is definitely an extension of Light Leaked and my curatorial work—the connective spirit and desire to learn more about other artists that Light Leaked is rooted in has spilled over into my photographic work. Working in areas other than my personal work feeds my inspiration and makes me feel connected to something bigger than my own thoughts. There is a balance that can be difficult, that I am constantly working on. Working on a lot of projects at once, for yourself and for your community, can drain your creative energy if you aren’t careful and sometimes I am not. I think it works best when the projects I’m working on overlap in intention and inspiration so they are feeding each other and not taking away from each other. MGK: How did you begin to curate Bridging Division? AK: I began curating Bridging Division about a year ago. I started with the idea that I wanted the space to be physically divided, visually taking on a division and restriction that needs to be interacted with to understand and to get around. 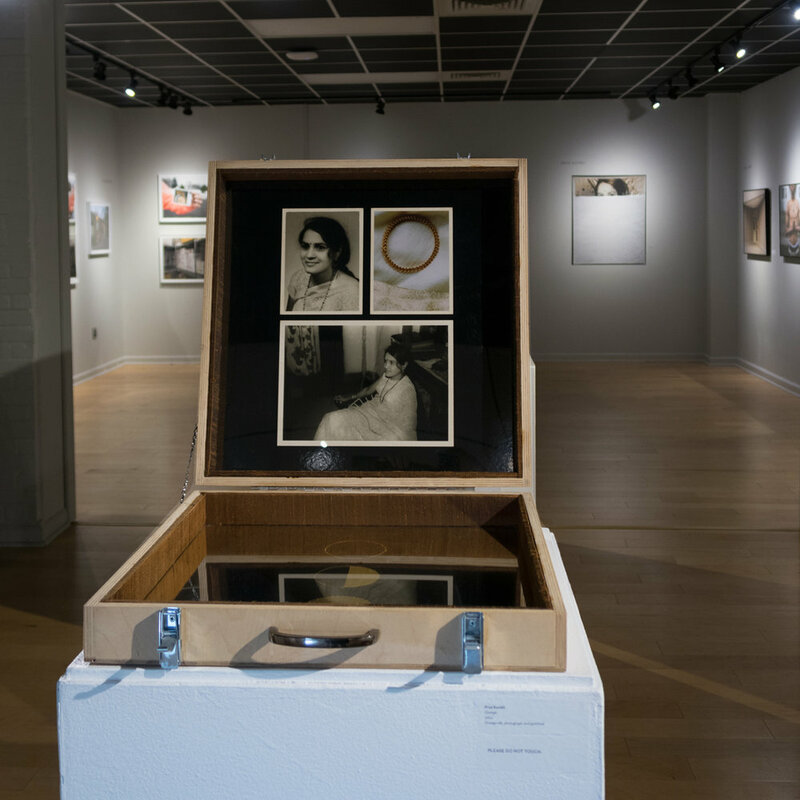 This started with Pryia Kambli’s suitcase work about emigrating from India to the States when she was 18. The suitcases are placed on pedestals that divide up the space and control and limit how viewers can move around. This was an exciting idea for me, as someone who works in an online space so often, to consider how viewers would be able to experience the show physically. MGK: Visually, the work in Bridging Division is very different. What has been particularly exciting or challenging about curating Bridging Division? AK: It was important to me for this exhibition to be diverse, both in the representation of the artists and the topics that each artist was investigating in their work. 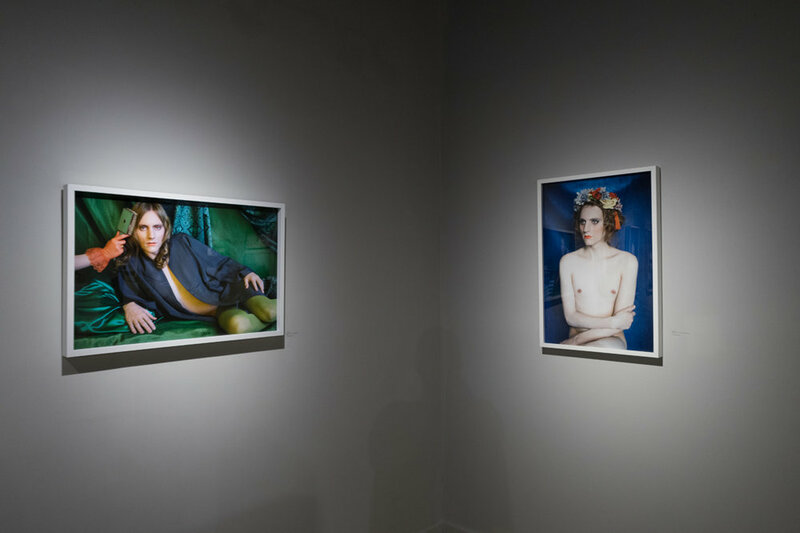 Overall, there are a lot of visual similarities that bring the exhibition into an aesthetically cohesive space like a strong focus on portraiture and some still life. I also laid out the exhibition with repeated movements between pieces that overall bring the whole show together further. This layout connects the similarities in aesthetics and the commonality of the power structures that are at work. MGK: How do you think curating shows like Bridging Division plays a hand in teaching empathy to viewers? AK: I hope that viewers interact with the work, allowing them to see through the artists’ eyes—their perspective—to get a look into experiences that they haven’t experienced and may not understand. The abstract process of interacting with art, any art, makes people more empathic and think more critically. I hope that by applying that process to work of diverse experiences, I will be creating an exhibition that will elicit empathy to its viewers. MGK: What has it been like working with The Light Factory? Can you give any advice for those, especially women at the beginning of their careers, looking to independently curate shows with larger galleries or organizations? AK: Amazing! They have vision to empower their community through art, and to empower and provide opportunities for artists and curators. It feels good to have someone believe in you, and that is how I have felt working with the staff and board at The Light Factory. I think this tends to be the case at non-profit spaces, everyone has a real passion for what they are doing and for the community that they are serving. For advice—I would say, for independently curating at a non-profit space consider the community that is being served and what kind of exhibition would benefit that community. In my experience opportunities for curation always begin by creating them for yourself. Start an online magazine or a curated Instagram, invite your friends to do it with you. Make connections out of genuine interest and find out everything you can about what you are interested in doing. Find smaller new galleries in your city or untraditional spaces or a UHaul van! Find a way to jury or curate an exhibition there, invite your friends to do it with you. People will take notice more quickly than you might think. An example would be that one of my students, Brennan Booker is currently jurying an exhibition with a USC alum Steffi Brink for a local art festival, Indie Grits. That is exactly what to do for those interested in contributing to their community through curation. MGK: How do you navigate the systemic barriers that women face, especially in the arts? AK: Phew, that’s a tough one. I think being an artist in general is tough, emotionally and otherwise. Navigating barriers that women face brings another level of self-doubt and fear to the process. First, I think it’s okay to acknowledge that in the world and within yourself. I think the best way to navigate or circumvent this is to create an empowering community around you. Find other artists that you respect and that respect you back. Check up on each other. Tell each other about opportunities. Create opportunities for one another. Be there for them when they feel like they can’t. Inspire one another. This keeps you going, and I think also makes life and art worth doing. MGK: What projects are you currently working on? AK: This summer I will mostly be focusing on a new body of work that I have not released yet, but have been working on for the last year called The Rise and Fall of Woman. 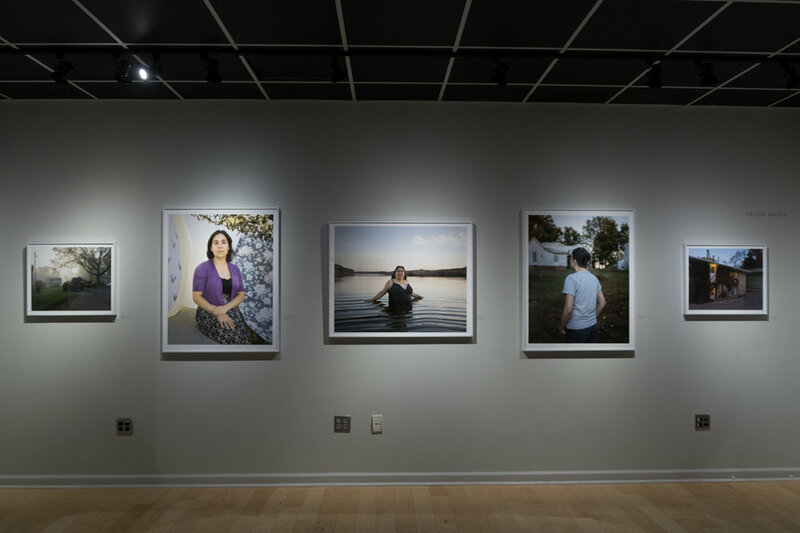 This project investigates women’s history and illuminates parallels to contemporary women’s lives. The series is divided into chapters of exploration: the history of events, female figures, violence against women, and the evolution of patriarchal systems. Each chapter uses a combination of color, light, symbolic constructions, still lives, appropriated imagery, performative shadows, and projections to communicate their underlying history and intention. Overall right now I have a desire to read more, make more work, and recharge my inner power.